Erin Doherty as Rachel Corrie. Photo by Ellie Kurttz. Rachel Corrie is lying on the floor, gazing up at the ceiling, her legs propped up against a set of tall wooden slats drenched crimson red. She’s playing some music on a portable CD player. The Big Dipper has been drilled into the top right hand corner of her makeshift wooden wall, but over the course of the play it begins to looks less like a celestial constellation and more like a bullet-riddled aberration. Right now, at the opening of the play, she’s in her bedroom in her hometown of Olympia, Washington, in the rugged northwest of the United States. She puts on a helmet. Her head, encased in it, thunks again the stage floor. It’s a sharp, unsettling sound, almost as if it were her skull against tarmac. But she rolls over, surveys the small studio audience in The Clare, and grins. So begins a play that cuts to the bone of the Israel-Palestine conflict through the eyes of a white, American, college-educated young woman. A young woman who documented her life with great warmth and candour, and who embraced the world the same way – and a young woman who was very quickly canonized by the public as a fallen heroine. My name is Corrie, and while I wasn’t named for Rachel Corrie, I remember – as a sixteen-year-old in 2003 – searching the internet for my name and its associations in the earlier years of search engines. The shrill static of a dial-up modem makes several appearances in the production, as it did frequently in my early forays into the internet. Rachel’s name was always the first to pop up, and the headlines that came with it. How strange, I always used to think, that a spotty Singaporean teenager might share a name with an American activist who decided to go to the Gaza Strip to protest Israeli occupation, one whose death I (as a young person in Asia) tended to associate with the actions of the Tiananmen Square Tank Man. Both tiny figures on a blurry television screen standing up against the military and its metal. Both brave to some, foolish to others. My Name is Rachel Corrie was first staged in 2005, two years after Rachel’s death. This revival 12 years later – and 14 years after the contested bulldozer incident that killed her – feels just as poignant, but also deliberately and deeply problematic. Outside the Young Vic on press night, picketers waved Israeli flags and gave out well-designed pamphlets mimicking the production’s marketing materials. Rachel, they say, ‘was a vulnerable young lady who was exploited. A young idealist manipulated by terrorist enablers’. But this production, intimately directed by Josh Roche (winner of the JMK Award 2017) and featuring a stunning, heartrending performance by Erin Doherty, doesn’t shy away from Rachel’s flawed idealism. They take a reflexive view of the text, which begins with Rachel’s political awakening in college and how she leapfrogs from cause to cause, trying to make some sort of meaning out of her comfortable life. The staging edges away from a portrait of Rachel as some sort of white saviour, instead sketching her out as a sheltered, privileged young woman who, through the cumulative experiences of her progressive upbringing, discovers her capacity for radical empathy and cannot turn away. Doherty’s Rachel is sunny, confiding, and immensely likeable. Doherty is astonishingly precise in her ability to capture the wide-eyed enthusiasm of an undergraduate who realises she inhabits a safe corner of a hurting world. Her Rachel has the book smarts of a student who’s consumed all sorts of texts on political economy and moral philosophy, but never had to live through a war. The language she uses just prior to her trip to Palestine sounds like she’s parroting the over-careful lexicon of the political correctness textbook. But this rapidly evolves when she arrives and makes a life on the ground in the ‘nonexistent place’. There’s no doubt Rachel cared deeply for the Palestinians who opened their homes and hearts to her. But so much of this epistolary play, stitched together from her journal entries and emails to family, still comes across as a white woman translating life in a non-white conflict zone into digestible morsels of information for a western audience. Rachel wrestles with the fact that she can choose to leave at any time; the Palestinian figures who are anchored to their homeland and must live through day-to-day violence are little more than cameo appearances in the recreation of her internal life. This, I must add, is more a problem of the play than the person. It is Rachel’s story to tell, and she acknowledges that she can’t help the life she was born into. But I’m also glad for other productions, such as Palestinian actor Ahmed Tobasi’s powerful coming-of-age story And Here I Am, that give insight into the polarising conflict from a Palestinian point of view. I sat gripped throughout most of the production nonetheless. Rachel’s lengthy polemics towards the end of the play are leavened with tremendous humour and heart. Some of her reasoning is contradictory, and her single-minded passion often blinds her to the fears of her parents terrified over the safety of their daughter. She’s as idealistic as she is disillusioned; she’s both incredibly mature and utterly naive. Even as the production attempts to sidestep an entirely romantic view of Rachel, there’s plenty of sentimentalising as the play comes to a close. But as I step out of the theatre, I wonder if I might ever possess the same reckless courage to pursue and support a cause I believe in. I also wonder what it is that makes us more keen to memorialise those who die young, and who die unexpectedly. These two trains of thought dovetail as my ‘what-could-be’ blends into Rachel’s ‘what-could-have-been’. At this point, I realise that most of the picketers have given up and faded into the night. Only two remain, and this time they don’t stop me as I walk down the street. 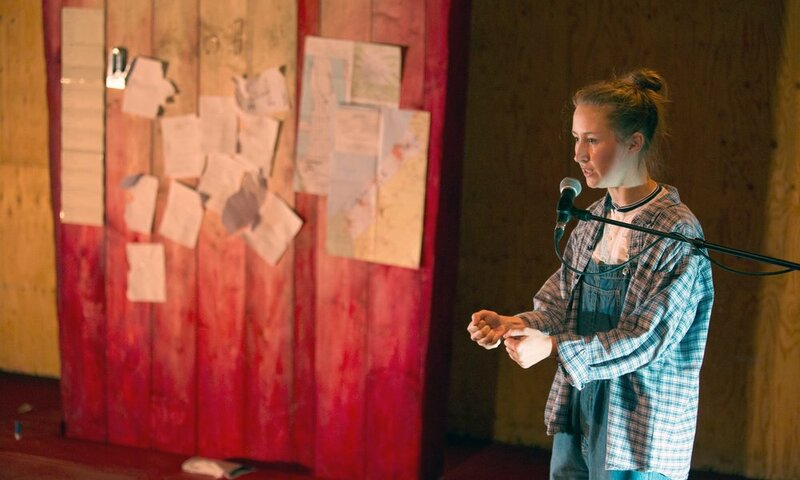 My Name is Rachel Corrie is on until 26 October 2017 at the Young Vic. Click here for more details.